Predator locker is very intelligent program ,you can lock and unlock your computer with thumb drive .Really this is very good idea .Read this article and download free trial predator also you can purchase program to have the full features. The most important idea in this program that you can lock your pc when you are away even if windows still opened .They use a normal flash stick as the access control for opening/ locking the computer . first insert your usb flash drive into your computer . Run predator program and leave it until you finish your work. If you decide to go away from your computer,just remove your usb flash drive. Keyboard and mouse are disabled when you remove your usb flash drive . Your computer screen become very dark. When you come back just insert your usb flash drive again ,keyboard,mouse and your screen will work as before state . The big advantage here is you don't need to retype password every time you lock or unlock your pc ,it's very simple . Another good thing ,Predator record every thing happened with computer if you are away ,so you will see full report and who tried to get access to your computer. Another advantage , if an intruder get access to your computer ,it changes the usb flash stick.It gives you more security . Also Predator disable the task manager so no one can end the program process. Also Predator disable your CD drive in windows because may be intruder can run malware software with the aid of CD drive . Now i hear your question , what i will do if i lost my usb flash drive ?.ok you know predator gives you solution for that , when you install the program for the first time ,you can put password to unlock your computer if your usb flash stick isn't available. 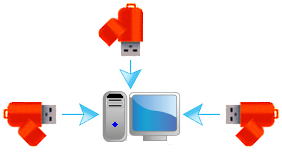 Another advantage is that you can protect multi computer with the same usb flash drive. you can use the program free trial or purchase to get the full features .